I've been reflecting on why the word "hormones" seems to pop into my mouth any time I talk about my passions or what I want to do with my life. My hormone journey really started with my skin. My acne was embarrassing and painful. Even today, I still struggle with it, and it affects more than just what my face looks like. It affects my mental state. It's an endless cycle of stress, acne, and shame and anger. For me, hormones in balance indicate a thriving life. And THAT is what I want for you. For a while, birth control was a bandage for my imbalanced hormones. When I realized that not only were the birth control hormones interrupting my body's natural processes, but they could not actually fix the problem, I knew I needed to get off the pill and figure out what was really going on. Debilitating cramps, acne, and digestive issues were alarm bells I didn't know to pay attention to, because I wasn't educated enough to know there was a problem. When I finally started paying attention and listening to what my body was telling me, I stopped feeling out of control and started to feel that there was something I could do to help. Understanding your cycle is knowledge and knowledge is power, at least when it comes to bringing your body back into balance. This is going to be the first in a series I like to call "Get to Know Your Cycle". I've gotten to know my cycle better over the past year and am continuing to experiment with how I can prevent further hormonal imbalances. I want to share that information with you through a monthly series getting to know the female reproductive system. It may seem daunting to figure these scientific things out, but it is amazing how simple (and, at the same time, complex) our bodies are to understand. Everything has a purpose within the body and everything connects together. It really is a magical thing once you start to understand how everything works! We're starting from the top this time to find out where our cycles begin: the hypothalamus and the pituitary gland. No one talks about hormones better than Alissa Vitti, the hormone whisperer and author of WomanCode. She writes, "Hormones that flow from glands in your brain dictate what organs throughout your entire body--all the way down to your ovaries--do. The hormones that those glands release, in turn, govern every major process your body performs, from setting your internal thermostat, to metabolizing food, to keeping your heart beating, to regulating your mood, to determining your fertility, and so much more." And this flow of hormones starts in your hypothalamus. 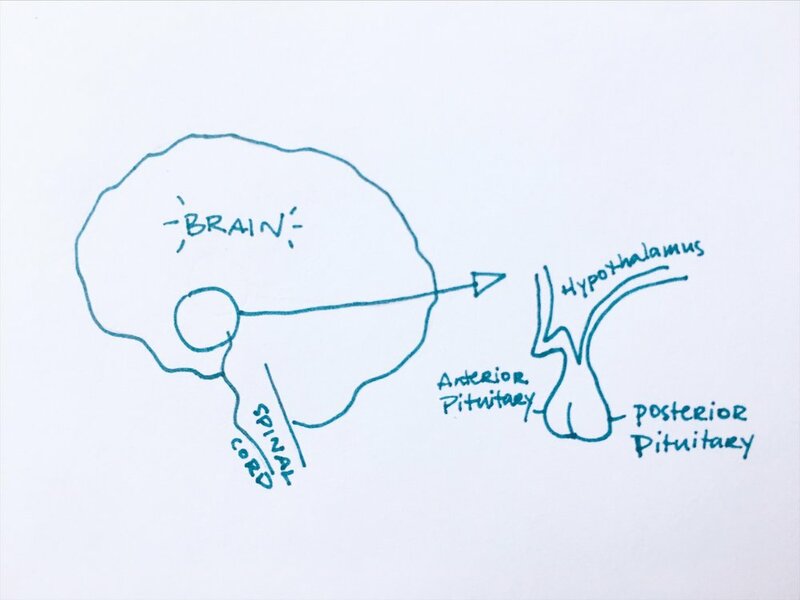 The hypothalamus is an almond-shaped region in your brain that receives information from the bloodstream about concentrations of hormones in the body and speaks to the pituitary gland. The pituitary gland lies below the hypothalamus and speaks to other glands and organs in the endocrine system: the thyroid, parathyroid, pancreas, adrenals, and ovaries. For example, beginning in puberty, the hypothalamus releases gonadotropin-releasing hormone (GnRH) to signal the pituitary to send out follicle-stimulating hormone (FSH) and luteinizing hormone (LH) to signal to the ovaries when it's time to start maturing an egg, the start of your cycle. Through the hormones it produces, the pituitary gland controls many vital processes and functions of the body, including growth, metabolism, blood pressure, reproduction, and sexual maturation. The little hypothalamus is also tied to the limbic system of the brain which controls the emotions and feelings, has a direct pathway to the adrenals, bypassing the pituitary gland in times of stress, and is also directly connected to the digestive system. It's such an important part of our brain! So to simplify: A little region in the brain named the hypothalamus reads your blood to learn how much hormones flows throughout your body. That region talks to a gland below it, called the pituitary, by releasing hormones. In turn the pituitary is signaled to send out hormones of its own to other glands and organs. Those glands and organs then produce their own hormones which compensate for any lack in the system or are needed to release at a specific time in your cycle. There are some things we can do to keep our hypothalamus functioning well. According to Dr. Josh Axe, author of one of my favorite books Eat Dirt, healthy fats, good sleep, reduced stress, and exercising regularly are all important to a healthy hypothalamus. Also adding in chromium-rich foods, such as broccoli, apples, bananas, oranges, potatoes, green beans, basil, and garlic and utilizing frankincense and myrrh essential oils are all great ways to keep the hypothalamus happy. Some herbs like vitex berry and maca can also be helpful, though I would recommend working with a practitioner to incorporate them into your routine. Next time, we'll talk more about the different phases of your cycle and focus on the follicular phase. If you want to dive deeper until then, I found the website You and Your Hormones really helpful at getting at the basic understanding of each layer of your endocrine system. It is a great resource from the Society of Endocrinology. This video from Crash Course is also a good visual lesson to go along with this series.